・The conventional approach to skincare consists of applying a coating of oil to the surface of the skin with cosmetics to keep moisture from the stratum corneum from evaporating and to protect the skin from external stimuli. ・The Faith Group is promoting a new approach to skincare that repairs the lamellar structure of the stratum corneum rather than protecting the surface of the skin with oil. 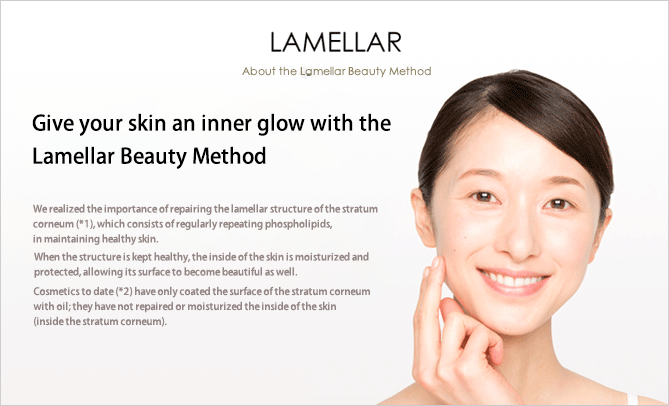 ・The Lamellar Beauty Method moisturizes the lamellar structure of the stratum corneum with natural phospholipids that resemble the lipids between keratinocytes in order to repair the skin’s natural barrier function and retain moisture. *1 The structure of the stratum corneum, which consists of moisture and lipids.